Sharp-tailed grouse, spruce grouse and even prairie chickens are unjustly maligned birds. It’s the dark meat. All have breasts that are dark like doves, pigeons or ducks. And, weirdly, their legs are lighter, closer to the “dark meat” you see in a good chicken. This confounds most hunters who bring these birds home. That means you want the breast meat cooked medium or even medium-rare. Pink, or red, not gray. In practicality, that means your roast sharp-tailed grouse or prairie chicken or spruce grouse should be started in a medium oven, then finished hot and fast. Or, you can get to the same place by using my pan-roasting method, which works well for smaller grouse. Put the birds in the fridge uncovered overnight. This will help dry out the skin a bit, and dry skin crisps and browns better. Take the birds out of the fridge and salt them well, then let them come to room temperature for 30 to 45 minutes. This is especially important if you are pan-roasting your birds. Truss your birds if you are cooking them in the oven. (Here’s a little video on trussing that can help you.) Do not truss if you are pan-roasting. Line the roasting pan with chunked-up root vegetables, coated in oil and salted. Roast these vegetables while your birds are coming to room temperature, as they will take longer to cook than the birds will. As for serving sizes, sharpies are among the larger grouse of North America, being larger than a Cornish game hen, but smaller than a frying chicken. So they’re a hard bird to portion out — one bird is a bit too much for one person, but splitting a sharp-tailed grouse among two people leaves both wanting more. Spruce grouse and ptarmigan are a bit smaller, so one per person is nice. Prairie chickens and hen sage grouse (do not roast rooster sage grouse, as they are too large and often too tough for this method) are larger than sharp-tailed grouse, so one for two people is fine. Besides, how many prairie chickens or sage grouse will you bring home? Not many is the answer. An interesting note on prairie chickens and spruce grouse: If you roast them with this method, strangely, they stay light in color. Not so light as ruffed grouse, but pinkish, like veal or pork. Not sure why this happens. I know some of you want to hear which method I prefer: oven roasting or pan roasting. Personally I prefer pan-roasting because I can get the bird cooked perfectly every time. But it takes some practice and requires your constant attention. The oven method is easier, but less precise. 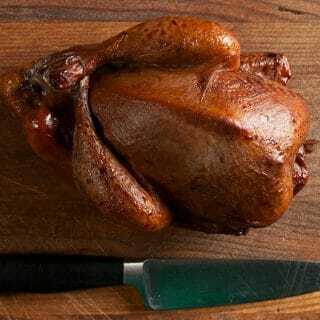 Whichever method you use for your roast grouse, enjoy it! These are some of the finest game birds in North America. Not that this recipe works with all dark-meat grouse, from ptarmigan to prairie chickens, spruce grouse to sage grouse. I also include a rose hip glaze for the grouse here you can use if you'd like. Most grouse love to eat rose hips, so it's a natural. You could use any jelly made from a small berry; I'd recommend currants as an alternative. You can skip the glaze if you want. Serve with roasted vegetables and a nice light red wine. Salt the grouse well and set out at room temperature for 30 to 45 minutes. Preheat the oven to 325°F. Cut the root vegetables into chunks, coat with oil or butter and salt well. Let these roast while the birds come to room temperature. If you're making the rose hip glaze, boil all the ingredients for it in a small pot until it thickens, about 5 minutes. Keep warm. Put the herbs inside the birds’ cavities. Either smear soft butter over the grouse or coat with oil. 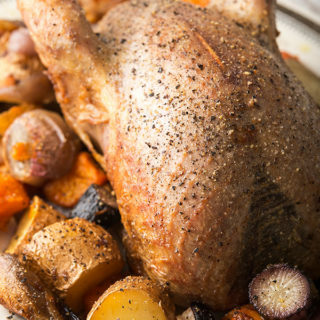 Take the roasting pan out and nestle the grouse, breast side up, among the roasting root vegetables. 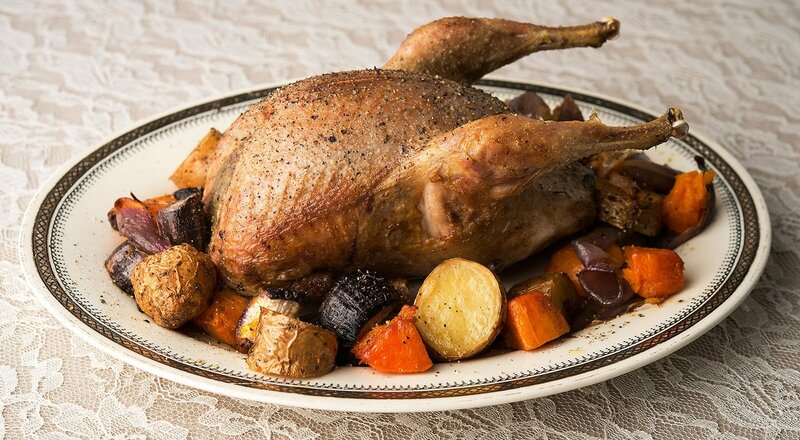 Roast hen sage grouse, prairie chickens or sharp-tailed grouse in the oven for 18 to 20 minutes, spruce grouse 15 minutes, ptarmigan for 10 minutes. Remove the roasting pan from the oven. Set the oven to 500°F, or as hot as it will go. Baste the birds with a little more butter or fat. When the oven hits temperature, return the grouse to the oven and roast until the breast meat hits about 140°F at the thickest part, near the wishbone. This should take anywhere from 5 minutes for ptarmigan to 15 minutes for a big prairie chicken or sage hen. 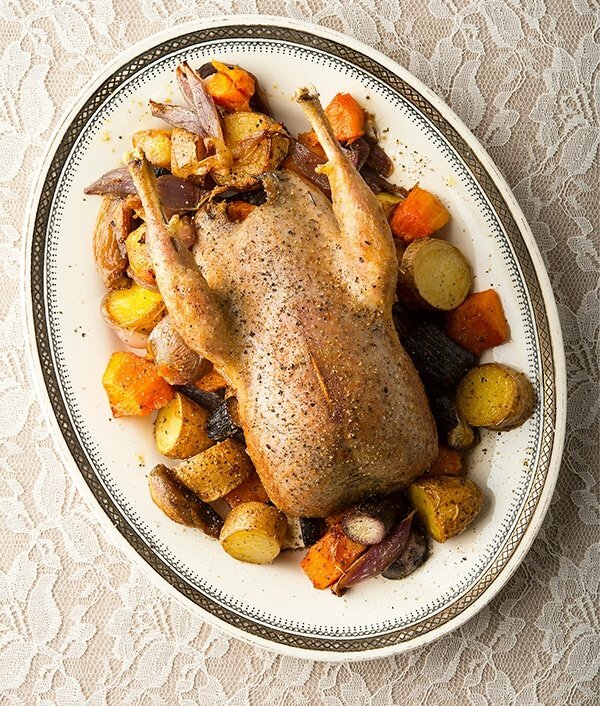 Discover more recipes for grouse and other upland birds here! Love to do this with ptarmigan. Dan: If you do it with ptarmigans, reduce the cooking time. Yes, I’ve hunted and eaten white-tailed ptarmigan in Colorado, and I am hoping to go to Newfie in late September just to chase grouse and ptarmigan! Hank, thank you for this recipe. I bagged my first sharpie last Fall in SK while moving from one duck spot to another of all things… I just roasted it according to your recipe and am now planning to skip a day or 2 of waterfowling in SK this Fall just so I can have this mouthwatering experience again.